Poker is the most easily-recognized and widespread card game in the world. This popularity is justified as poker is one of the few games where players’ set of skills can greatly tilt the odds in their favor. Poker is enjoyed by millions of recreational and professional players the world over, not to mention the advent of technologies in the last two decades has made it possible for fans to play their favorite game of skill online, from the comfort of their surroundings. If you are a poker novice, we strongly recommend you take a look at our brief overview to find out more about the rules, the betting structure, the ranking of the hands, and the three most widespread variations of the game. But first, allow us to a start with a brief history of the most played card game in the world. Where and when did poker originate remains a subject of debate to this very day. According to some theories, a similar game evolved over ten centuries ago and its origins can be traced back to China. Then again, there is evidence to suggest that poker evolved from the game of ganjifa that enjoyed a great popularity in 16th-century Persia. This game is believed to be the predecessor of all card games in the world, but it also laid the foundations for As Nas, which was shockingly similar to what we know as poker today. In As Nas, players were said to resort to bluffing and were given the options to fold, raise or match their stakes. Nevertheless, it is the French game of poque, which is believed to have paved the way for the emergence of poker. In fact, both poque and poker share a similar betting structure and hand ranking. After the French colonized Louisiana at the turn of the 18th century, they brought poque to the port city of New Orleans. The game’s name gradually evolved into “poker”. However, it was not until the beginning of the 19th century that poker really took off. The game spread throughout the continent like a wildfire thanks to the steamboats that transported goods and passengers on the Mississippi River. In the mid 19th century, the 52-card deck and the hand rankings we use today were adopted. Poker gained huge popularity throughout the American West and by the second half of the century, there was hardly a saloon without a poker table. It was around that time when Seven-Card Stud, one of the most popular poker variations, was born. In the 1930s, gambling was proclaimed legal on the territory of Nevada and thousands of poker enthusiasts flooded the casino floors in the gambling capital of the world. Several decades later, another variation of the game, Texas Hold’em, emerged and prevailed over Seven-Card Stud in terms of popularity. The 1970s marked the beginning of tournament poker after the start of the World Series of Poker (WSOP). Poker was officially recognized as a mind game after the International Federation of Poker was established in 2011. The official rules of the game were outlined for the first time at the turn of the 20th century. As there are many variations of poker, it makes sense that some of the rules vary. Some of most widespread variations of the game are Texas Hold’em, Omaha Hold’em, Five-Card Draw, and the Seven-Card Stud. Despite some minor discrepancies in the rules, these variants all rest on the same principles and utilize the same hand rankings. A standard French deck, containing 52 cards is used to serve two to ten players. However, in some variants like Seven-Card Stud, the optimal number of players is said to be five to eight because each participant is dealt seven cards so there is a possibility of exhausting the deck prior to the last deal. The deck is shuffled, riffled and cut either by the dealer or by the players after which, the game can commence. The objective is simple – each player aims at forming the strongest five-card hand in order to claim the pot. The ranking of the cards from the highest to the lowest is the following – A, K, Q, J, 10, 9, 8, 7, 6, 5, 4, 3, and 2, but in some variations, the Ace is the lowest in terms of rank. Please note that the four suits (clubs, diamonds, hearts and spades) are ranked equally so no suit can prevail over another. If it happens so that two players hold hands of equal ranking, they split or chop the pot. Prior to the game’s start, players typically seed the pot by contributing a small, yet mandatory bet. The latter is referred to as a forced bet. It can be an ante all players are required to pay as an entry-fee or it can be a blind. There are, in fact, two blinds – big and small. Those are paid by two of the participants at the table and count towards their bets, unlike the ante. In the hugely popular variation Texas Hold’em, players are dealt two hole (also called pocket) cards that are facing down. At the start of the first betting round, players act clockwise with each participant in the game calling (matching) the previous bet, raising (betting a larger amount) or folding (quitting their hand). Then, three community cards, known as the Flop, are dealt face-up at the center of the table for all players to use. The players again take turns in acting, but there is also the option to check (declining to act while still remaining in hand) or bet. A fourth face-up card, the Turn, is dealt next to the Flop. Another betting round follows with players calling, checking, folding, betting or raising. A fifth and last community card, the River, is then dealt next to the Turn. The final betting round commences with all players in hand choosing one of the five betting actions. Finally, when everyone has acted, the Showdown starts and all players flip over their two hole cards. The player with the highest-ranking five-card hand is the one to pocket the pot. One important thing to remember is that a poker hand always consists of precisely five cards, no more, no less. 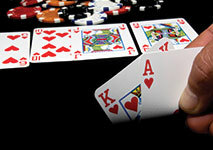 Some poker variants like Omaha Hold’em, the Seven-Card Stud, Texas Hold’em, and Five-Card Draw utilize what they call the “high” ranking of hands. Other variants like Omaha Hi-Lo and Stud Hi-Lo use the “low” ranking of hands to award the lower half of the pot. In games like Razz, the hand ranking is practically inverted as the player holding the lowest hand in terms of rank collects the pot. We have categorized the high ranking of poker hands from the highest to the lowest hand. This is practically an unbeatable hand in poker, which contains five suited cards, ordered from Ace to ten. It is a sub-category of the Straight Flush. There can be only four Royal Flushes when a 52-card deck is in play. This hand consists of five suited cards in sequential order. When two Straight Flushes tie, the player holding the highest-ranking card at the top of the sequence wins the pot. Also known as Quads, this hand contains four cards of equal rank and an irrelevant side card, called a kicker as is the case here. It consists of three cards of the same rank, plus a pair of cards of a different rank. The Flush is any five cards of identical suit. The cards, however, are not in sequential order. Otherwise, the hand would be a Straight Flush. The Straight contains five unsuited cards in sequential order as is the case in the example above. This hand contains three cards of equal rank, plus two kickers both of different ranks as is the case above. As the name indicates, this hand consists of two cards of equal rank, another pair of cards of a different rank, plus one irrelevant kicker. It consists of two paired cards of the same rank, plus three kickers that are all of different ranks. This hand does not fall into any of the above-listed categories and is the weakest possible option in poker. Here all cards are unsuited and of different ranks. Low-ranking games utilize the so-called Ace to Five Lowball rank, where the suits are again irrelevant. In such games, it is impossible for players to form Flushes or Straights, and the Aces are always counted as the lowest cards in terms of rank. The hand is evaluated starting with the top card and proceeding with the ones that follow. Also known as the Wheel or the Bicycle, the Five Low is the best possible hand in lowball games. It contains five cards in sequential order, starting with a five and ending with an Ace, like this 5-4-3-2-A. If two players tie, they split the pot. This hand consists of five, unpaired cards and the six is the highest of them all as is the case here 6-4-3-2-A. As you can see, the cards are not of sequential ranks, the only requirement is that the six is the highest card in the hand. In case of a tie, the player holding the lower-ranking second card is the one to claim the pot. This hand contains five unpaired cards, the highest of which is the seven. Ties are broken on the basis of the lower-ranking second card in the hand. If necessary, the third, fourth, or fifth cards are also used to break ties. An example of one such hand would be 7-5-4-3-A. It contains five unpaired cards, the highest of which is the eight as is the case with 8-6-5-3-2. Ties are broken in a similar manner as ties on Seven Low and Six Low. As mentioned previously, poker players are usually required to contribute to the pot by committing with forced bets before any cards are actually dealt to anyone. We can distinguish between several types of forced bets, the most popular of which is the ante. The ante is often labeled by players as “dead money” because it actually does not count toward their bets. It simply is used as an entry-fee to buy your way into the game. Furthermore, the ante is paid by all players occupying a seat at the table. Typically, the ante is the amount of one betting unit and may coincide with the minimum bet, allowed at the table. The second widespread type of forced bet is the blind. There are actually two of those – the small blind and the big blind. Not all participants in the game are required to pay blinds. It all depends on where the dealer button is placed. It is used to determine the order in which the players act. The button rotates around the table in a clockwise direction. Whoever holds the dealer button is the one to act last. The player sitting immediately to the left of the button pays the small blind which is half the amount of the big blind. The player to their left pays the big blind. As the dealer button rotates around the table, players take turns in paying the blinds. Please note that unlike the ante, the blinds do count towards the players’ bets. In order to be a successful poker player, one needs to become well acquainted with two important terms – pot odds and equity. The former refers to how much it costs a player to stay in hand in comparison with the size of the current pot. As each betting round starts, players need to decide whether or not the sum it would cost them to stay in hand is worth the amount of the pot they are playing for. The pot odds are usually expressed either as a ratio or as a percentage. You will be able to find more information on how the pot odds are calculated in subsequent articles. The second thing players should factor in is the equity. The term refers to the amount of the pot that belongs to a specific player, based on what cards they hold. Thus, equity changes from one hand to another. As a general rule of thumb, if one’s equity in the pot stands at or exceeds 50%, they should raise on this betting round. If not, players are recommended to either fold or check to avoid feeding more money into the pot. As we have mentioned previously, there are lots of poker variations, which is hardly surprising considering this is the most played card game in the world. However, some variants are more commonly played than others. These include Texas Hold’em, Omaha Hold’em, and the Seven-Card Stud. Texas Hold’em has gained tremendous popularity in the last decades, mainly due to the fact it is the title game of the World Series of Poker tournaments. The game is not that difficult to learn but mastering it may take years. Texas Hold’em is a community-card game and can involve either an ante as an entry fee or blinds. The first betting round is referred to as the Pre-Flop, where each participating player is dealt two hole cards. Players can call, raise or fold, taking turns in a clockwise direction. The second betting round is referred to as the Flop where three community cards are dealt face-up in the center of the table. The players in hand can then choose from checking, betting, raising, folding or calling. The third betting round, or the Turn, starts with another community card being dealt at the table and players can again choose from the five betting options above. The fifth community card is called the River and marks the end of the last betting round and the start of the Showdown. All players expose their hole cards. The aim is to form the best possible five-card hand, using one or two hole cards and some of the community cards on the table. The player with the highest-ranking hand wins. In cases of a tie, the pot may be split or “chopped” between two players. Omaha Hold’em follows roughly the same rules as Texas Hold’em as it, too, is a community-card game with a betting structure that involves a Pre-Flop, a Flop, a Turn and a River. Players are again required to buy their way into the game by paying a forced bet. Depending on the structure of the game, the forced bets can either be antes, paid by all participants, or blinds, paid by the two players sitting immediately to the left of the dealer button. The key difference here is that players are dealt not two, but four hole cards on the Pre-Flop. The betting options on the Pre-Flop are again to call, raise or fold. Three community cards are dealt on the Flop, another one is dealt on the Turn, and a fifth one – on the River, with players checking, betting, raising, folding or calling. Another major difference is how the winning hands are formed. Players are required to form their hands on the Showdown by using precisely two of their hole cards and three of the community cards on the table. Hand rankings and tie-breaks coincide with those in Texas Hold’em poker. Until the 1970s, the Seven-Card Stud was actually the most popular poker variation. However, the game is still widely played to this day. It has a slightly different betting structure than the previous two variants. 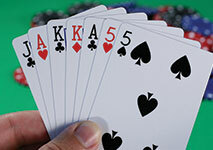 As the name indicates, players are dealt not five, but seven cards. All participants are required to pay an ante, which typically amounts to 10% of the minimum bet at the table. Then, one of the players pays a forced bet, called the bring-in. The latter is usually larger than the ante, but smaller than the minimum bet. Once everyone has contributed to the pot, the opening betting round starts with each player receiving two hole cards and a third, face-down card, called the door. The player holding the lowest-ranking door card is the one to pay the bring-in. If two players are dealt door cards of equal rank, the suits are used to break the tie. In Seven-Card Stud, the suits are ordered alphabetically like so – clubs (the lowest suit), diamonds, hearts, and spades (the highest suit). Each player then acts in turn and the first betting round, the Third Street, starts with everyone receiving a second face-up card. During the subsequent betting rounds, the Fourth, the Fifth and the Sixth Street, each player is dealt three more cards that are facing up. The final round is called the Seventh Street and this time, players are dealt one last hole card. Each person at the table now holds three hole cards and four face-up cards – the Showdown can begin. Everyone flips over their three hole cards and the player in possession of the best five-card hand scoops up the pot. The remaining two cards, which are not used to form the hand, are called “dead” cards because they hold no value in evaluating the strength of the hand. That being said, the hand-rankings in Seven-Card Stud coincide with those in Hold’em games.